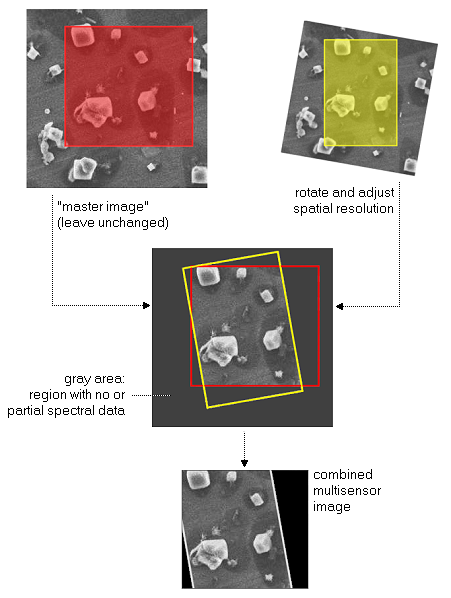 There are several problems which have to be addressed when combining several hyperspectral images to a single multisensor image data set. At first the differing image positions as well as the different image resolutions have to be aligned. ImageLab interpolates all images to be combined to the resolution of a selected master image. The matching is achieved by comparison of the spectral images to a reference image (i.e. a photo obtained from a microscope). The general approach of ImageLab is to create a combined dataset of several spectroscopic methods by copying and interpolating the original datasets into a new multisensor dataset, leaving the original datasets untouched. This ensures data integrity, since interpolation artefacts may be checked by looking at the original datasets. In order to combine two or more hyperspectral images, choose "Tools/Combine Hyperspectral Images". This enables you to select the images you want to combine and highlights the most important parameters of the individual images.